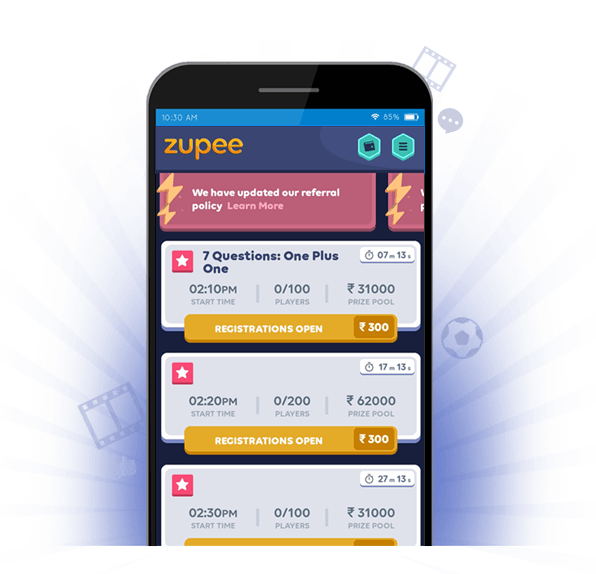 Zupee - Live Trivia & Quiz with real money! Admit it, taking online Q&A is so much fun—the thrill of answering questions within a time limit and waiting for the result—it’s such an adrenaline rush. Now imagine, taking the same Q&A where you can compete with thousands of other players simultaneously, and earn real money within a matter of seconds! With over 200+ live tournaments running 24 X 7 every day, Zupee provides entertainment and fun round-the-clock. You can pick a topic of your choice—from Bollywood, Hollywood, Sports to Maths, Spellings, Hinglish and more. Play the Q&A and answer each question as soon as you can to win cash on the spot. The faster you are, the higher your score. The winning prize money pool is distributed between the winners and can be withdrawn instantaneously through Paytm. Since thousands of players participate at one time, you can win up to thousands and lakhs! With guaranteed success on Zupee, EVERYBODY IS A WINNER! Warning: This game may lead to excess fun and excitement. The side-effects also include an increase in your knowledge and wallet at an unusually fast rate.